Isn’t he a “beaut”? 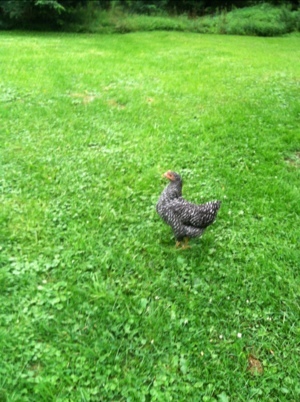 That’s Alastor our (now purple) silkie rooster. He had quite a run in with Molly, our biggest Buff Orpington hen last week, and frankly I think he’s lucky to be still be crowing. She’s a bit of a beasty. 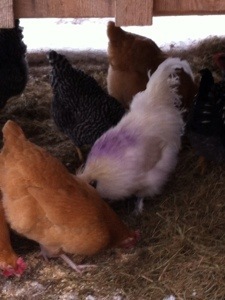 When I found him he was bleeding pretty badly from his head and comb, so my husband quickly grabbed some Blu Kote spray and well…now we have a purple rooster. I’m wondering how long this color will last? I’ve read that some chicken keepers use a substance called pine tar on injured birds, but I haven’t seen where to buy that yet or know much about it. From what I have read though, the important thing is to cover the location of injury so that the red blood is not visible to the other chickens in the flock to prevent them from pecking at the injury. We saw that happen the first time Alastor tangled with Molly shortly after his arrival this fall. My youngest daughter and I headed out the coop to feed them some salad scraps and found him a with a bleeding gash and the hens all going right after that spot. I had read about it, but was rather shocked to see how brutal they really were about it! My 4-year-old was unruffled by it though. She remembered what I had said about chickens turning cannibal (yes, OF COURSE the kids would remember THAT part about chickens!!!) and started shouting at the hens “DON’T EAT MY DADDY’S CHICKEN YOU CRAZY CHICKENS!!!! !” She was a big help actually with getting him separated from the hens so we could treat him with blue coat and get everything settled down out there. Quite a lesson. The last couple of days we’ve had a nice break from all the snow, so were able to get in and clear out their pen area and get them all outside during the days, which I think has helped the situation a lot. They seem to be calmer and hassling each other a lot less. I think we’ll all be really happy when spring finally comes this year! At long last, we have eggs! 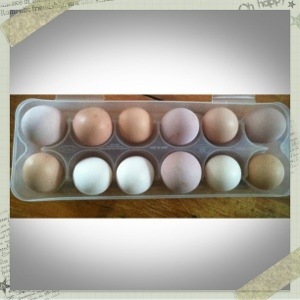 It’s been 210 days since the chicks arrived in the mail, and this morning we had a full dozen home grown, fresh eggs in the carton! What an amazing feeling. I was so inspired by this sight, I decided to bake some homemade bread and thaw some of the strawberry jam I put up this summer so that tomorrow morning we can have a “feast” of homemade/grown foods and really relish the outcome of putting some effort into growing/making our own food. We are getting an average of 4 eggs per day now out of 11 hens, so I am expecting to see a lot more production on that front. It’s snowing now and we are getting into the full swing of winter, and I am relieved to see that we do in fact have winter layers- just not sure which ones they are yet! 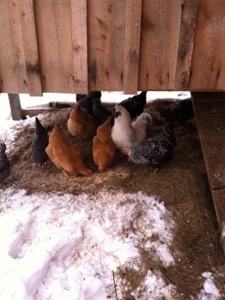 For certain, I caught our smallest Barred Rock in the nesting box yesterday. Can’t wait to serve up this “from scratch” breakfast to my family tomorrow! 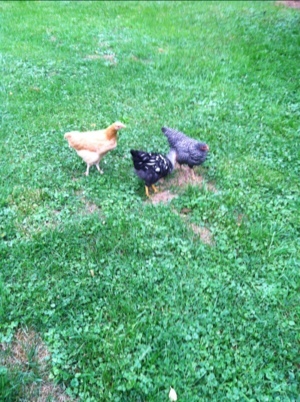 After a few weeks getting the ladies acquainted with their new digs, we got brave this evening and set them free to range the yard. I have been really nervous about this, afraid they will wander off, get in the road, or meet another untimely end… So we will go slow with the ranging. Pasturing, I guess it is now referred to as free-range seems to have lost its labeling cred. They took straight to it though – not venturing to far from the coop but definitely interested in all the surrounding gardens etc. The kids got to test out their chicken-herding skills….which consist mainly of lots of shrieking, jumping, flapping pretend wings, and an ungainly chicken dance performed in footie pajamas and barn boots… You had better believe those chickens went running for their coop!!! After 37 years of avoiding the dreaded chore of raking grass clippings – no matter what sort of threat my parents could issue or guilt trip my husband could attempt to throw at me- here I am HAPPILY raking up my freshly mown grass to toss bucket after bucketful in to watch the hens dive into it. Who knew… Who ever could have guessed there would ever be a point to such a normally pointless task! 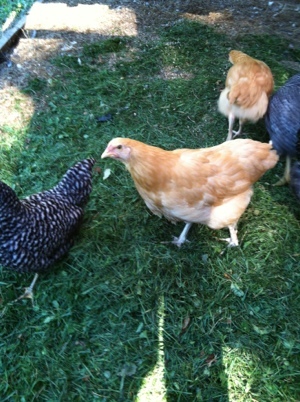 The girls thought it was so fun to see how excited the hens got that they ran to get their toy garden rakes and join in “the fun”! Now, if I could just find a way for those hens to convince the kids that cleaning their rooms is “fun”….